Parwal is a seasonal vegetable and is available during summers till monsoon season. Parwal/Pointed Gourd/patal/potol is mainly used in North and East India specially in the states of Orissa and Bengal.The vegetable looks like tiny cucumbers, with tapering ends and it has faint, lighter green lines along its length. The skin is much harder than cucumber. 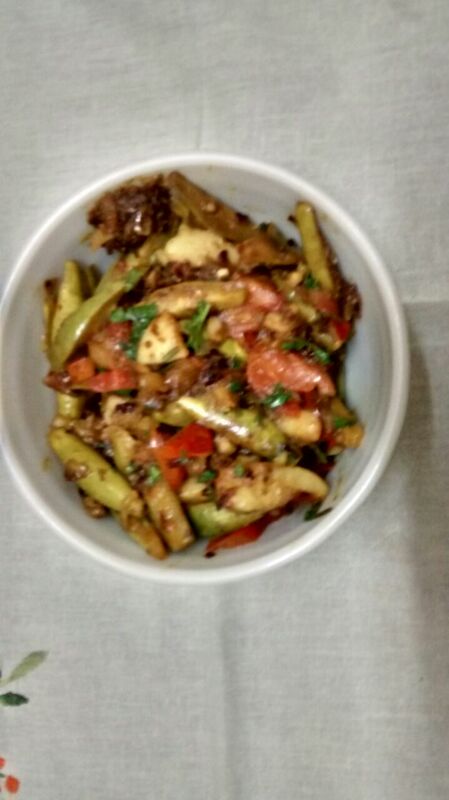 Recipe contributed by Mrs. Usha Mehta. Wash and slice the parwal in wedges (lengthwise). Keep aside. In a pressure cooker put 2 cups of water and potatoes. Place the cooker on high flame, the moment full pressure is formed , reduce the heat to low flame and cook for 3 minutes. Switch off the stove. When pressure cooker cools down to room temperature, open the lid take out the potatoes, peel and slice in wedges length wise. Keep aside. In a wok / kadahi/ or heavy bottom pan heat oil, add cumin seeds, when it starts crackling add asafetida/ Hing and fry for few seconds. Add chopped onions, sauté the onions till translucent add grated ginger, chilies, coriander powder, turmeric, sauté for few seconds more. Add in the sliced wedges of parwal into the pan. Sprinkle salt, mix well cover and cook the parwals. Let it cook on low to medium flame until the parwal is half cooked. Once the parwal is seventy percent cooked, add in the boiled potato wedges, and tomato wedges stir and cover the pan. Cook tomatoes, parwals and the potatoes until parwals are tender add . Once the vegetables are softened, add in the amchoor / dry mango powder, and garam masala. Mix the vegetable very well. Stir fry for another minute and turn off the heat. Stir fry for another minute and turn off the heat. Transfer the aloo parwal sabzi into a serving bowl. Garnish with finly chopped coriander and Serve hot the Aloo Parwal Sabzi along with Dal of your choice and a bowl of hot rice or chapattis. Note: The parwals are added first, as it takes a little longer time to cook. The green colored veggie parwal is loaded with good sum of fiber, which helps to promote proper digestion. It also helps to solve gastrointestinal and some problems related to the liver. The seeds present in the parwal vegetables help to ease stool and is recommended to reduce constipation problem. When you are eating parwal dish do not throw out the seeds out of it, they help to control blood sugar levels, which in turn lower the cholesterol in the body. The gourd vegetable pointed gourd has the property of low in calories. So, one can eat this vegetable based curries with no doubt to reduce their weight. It helps your stomach to feel fuller and controls the urge to eat. 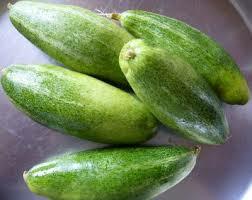 Another health benefit of consuming pointed gourd includes the purification of blood. According to Ayurveda painted gourd works effectively to regulate Kapha. It cleans our blood, tissues and thereby offering skin care as well. According to Ayurveda parwal has the capacity to boost your immunity. It is used like a medicine to treat flu, throat problems and high temperatures. As we age wrinkles and fine lines are most common visible signs on our face. Parwal with its rich source of antioxidants, vitamin A and C helps to fight with the free radical molecules which are promoting the aging signs. These are the health benefits of consuming pointed gourd. So eat them and stay healthy and beautiful.